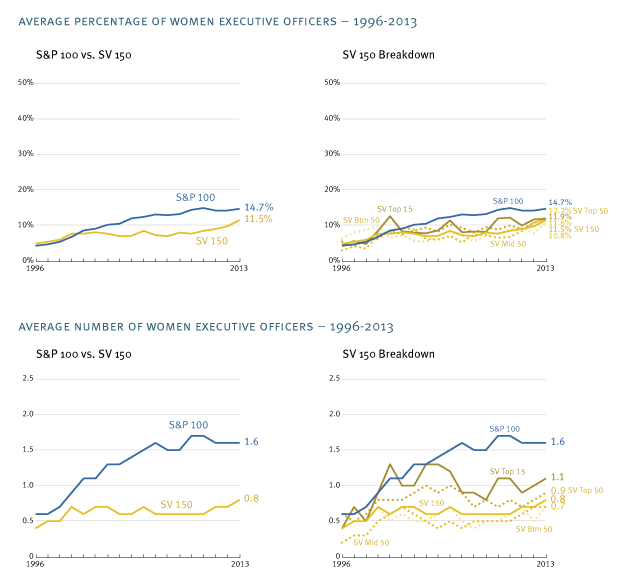 We developed all the data graphics (about 70 individual graphs and charts) for a report on Gender Diversity in company leadership that was published this week by Fenwick & West. 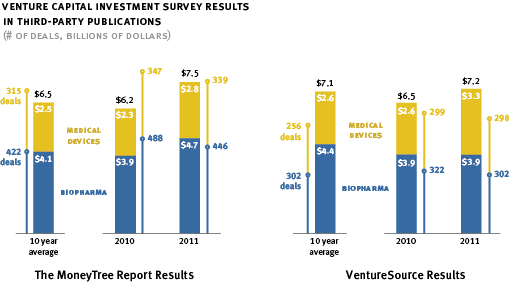 The report compares the top Silicon Valley companies with the S&P 100. According to the survey, Silicon Valley companies overall have less female representation in company leadership than large public companies nationwide, though both seem to be increasing in representation over time. 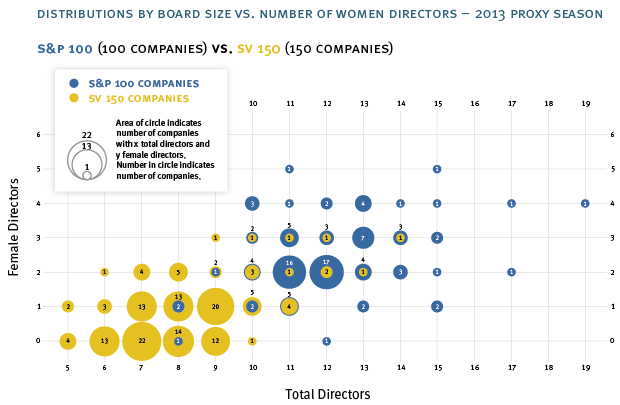 This bubble chart gives you an overall sense of female representation on boards of different sizes. You can see that the S&P 100 companies tend to have more directors overall, and also more women directors. How long will Silicon Valley companies stay clustered at the bottom? The Wall Street Journal picked up the story. You can download the full report from Fenwick & West’s website: Gender Diversity in Silicon Valley: A Comparison of Silicon Valley Public Companies and Large Public Companies. I met someone recently who pointed me to an interesting tool – apparently an outgrowth of Google’s efforts to digitize anything ever printed. You can track the frequency of any words that have appeared in print over the last many years. Try it. If you are competitive, like I am, you’ll find it hard to stop. Tell me your favorite comparisons. I’m adding a few more graph samples from the Gender Diversity study, pertinent to an interesting discussion of appropriate line graph scales on Alberto Cairo’s The Functional Art blog and a discussion of slopegraphs on Andy Kirk’s Visualising Data blog. I think I was first introduced to slopegraphs in Alberto Cairo’s book, The Functional Art (a book I recommend to anyone wanting to do a better job of presenting data). 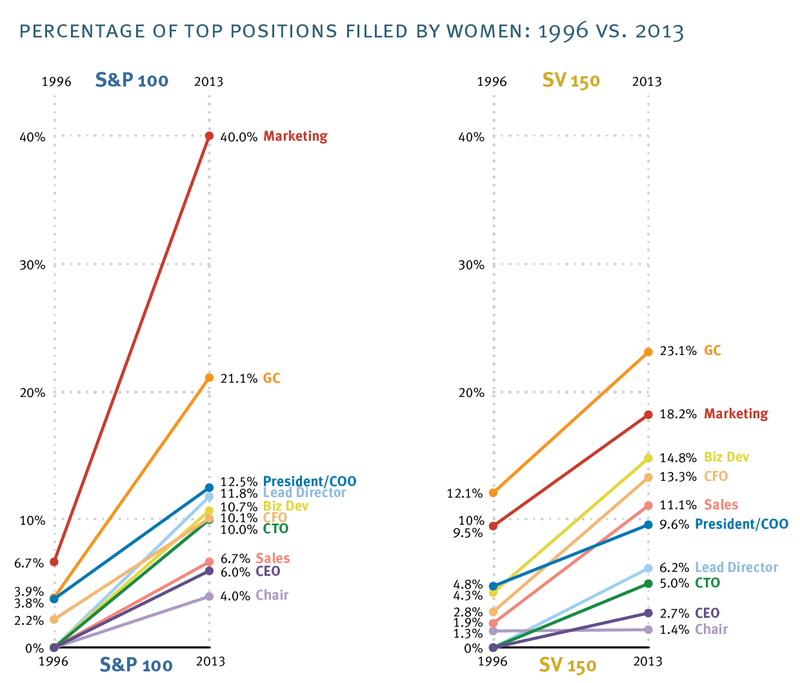 We used them to show the change of women in key positions from the beginning to the end of the survey period. “GC” is for General Counsel – the other abbreviations are probably more familiar. 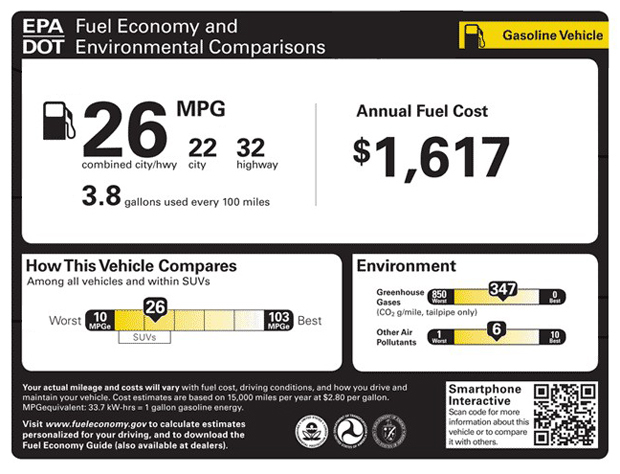 The EPA has announced a new fuel efficiency label for cars – mandatory in 2013. It’s a nice effort toward providing some information design, but it makes my head hurt a little more than it should. Too much cramped type, overbearing borders and a confused information hierarchy. The apparently committee-designed version adds a figure for what you will save (or spend) compared to the average vehicle over 5 years. Seems like that could have been integrated with the Annual Fuel cost more tightly to save space and increase clarity. The original proposed design (below) had a little more breathing room and the useful feature (in my opinion) of ranking fuel economy within the vehicle class as well as compared to the overall average. For those who need a large car (to carry 8 kids safely through the mountains, for example), it’s just stating the obvious to tell them that an SUV is not going to have the fuel economy of the average car. It took 30 years to decide to do this redesign. Look for a new and improved label in 2040. Threestory Studio’s second data visualization project with Silicon Valley law firm Fenwick & West was released to the public this week. 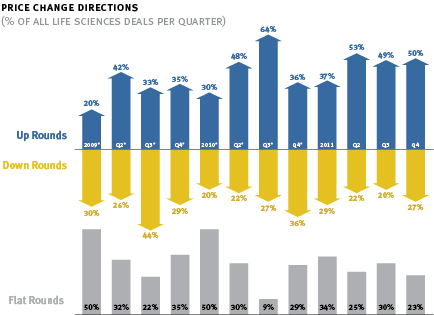 This report looks at trends in venture-funded deals in the life sciences. Though not as extensive or complex statistically as the first one (Corporate Governance Practices and Trends), this one presented some interesting challenges in presenting data clearly, accurately and concisely. I’m happy with the results.